Play Theory: This flag football play is mainly used to pick up short yardage (<10 yards). However, some slight adjustments can yield a big play later in the game. The idea behind this play is that the two receivers on the left (Red & Blue) will occupy the cornerback and safety on that side allowing the left lineman to leak out in the flat. If the quarterback has more time and the safety chases Red, then the center may be open on the deeper route. Play Variations: Run this play a couple times in short yardage situations. Then, if in the situation again, run the play with this variation. Send the slot receiver (Blue) on a slant and go. The safeties should be occupied with Red & Green. This variation will be more effective if it’s your team’s first attempt at a deep pass. 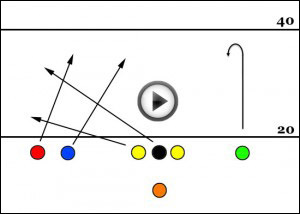 Find other free flag football plays in the “Free Plays” section of the website.